Celebrating the Life and Work of John F. Nash, Jr. The Mathematics Department of Princeton University hosted a “Celebration of the Life and Work of John Nash” on October 24, 2015. In the morning and early afternoon, there were mathematical lectures on Nash’s work by Eric Maskin, Sergiu Klainerman, Mikhail Gromov, and János Kollár, followed by a public lecture by biographer Sylvia Nasar and a remembrance service in the University Chapel. Please see the event’s webpage for further details. 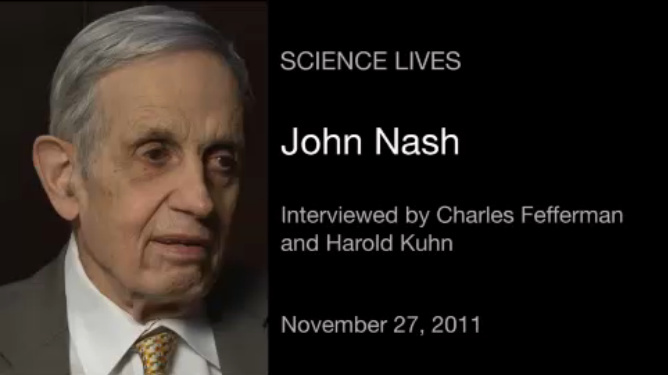 Click to be taken to the Nov. 27, 2011, Science Lives interview.